Panasonic TVs powered by Firefox OS officially launched | What Hi-Fi? Six of Panasonic’s new TVs, including its first curved screen, will feature the Firefox operating system. Five months after receiving their debut at CES 2015, Panasonic’s Firefox powered smart TVs are available to buy. The TVs in question are the CR850, CR730, flagship CX800, CX750, CX700 and CX680. The OS works on a system of ‘decks’, with three coming as standard: Live TV, Apps and Devices and you’re able to pin apps, games and favourite channels to the relevant deck. The Firefox OS also lets you cast content from a smartphone or tablet when connected to the same wi-fi network and there’s the usual selection of apps including Netflix, Hulu and YouTube. The TVs are also optimised for HTML5, meaning they play nicely with web-based apps. 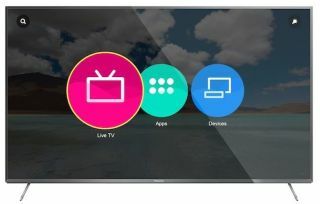 Masahiro Shinada, Director of the TV Business Division at Panasonic says: "Through our partnership with Mozilla and the openness and flexibility of Firefox OS, we have been able to create a more user friendly and customizable TV user interface."